Speeding up public administration reform (PAR) in the financial and budgetary sector and facilitating people and businesses is a central task of the financial sector in the coming time. 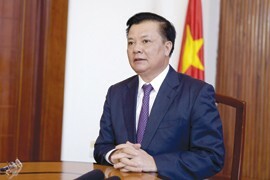 Finance Minister Dinh Tien Dung has granted an interview on this issue. Le Hien reports. How have institutional and policy reforms conducted by the Ministry of Finance impacted administrative procedure reforms and facilitated people and enterprises? The institutional reform at the Ministry of Finance is always involved in law perfection, through which the financial law system has made significant improvements in amended, supplemented or promulgated legal documents. With many creative methods as a single law amends multiple laws, a decree amends multiple decrees and a circular amends multiple circulars, many legal documents have powerfully impacted, addressed hardships against enterprises, improved the business climate and create a regulatory corridor to simplify administrative procedures, reduce business requirements and modernise management, thereby gradually transforming management from pre-check to post-inspection (despite increased pressure and responsibility to authorities but more ease for people and businesses), and enhancing the transparency of information, procedures and processes. In the 2011 - 2015 period, the Ministry of Finance submitted to the National Assembly 14 draft laws, four draft resolutions of the National Assembly and three draft resolutions of the National Assembly’s Standing Committee. The ministry, at the same time, submitted to the Government and the Prime Minister 99 decrees, 109 decisions and 1,104 circulars. From 2016 to October 2, 2018, the ministry submitted to the Government for proposal to the National Assembly four bills, three resolutions of the National Assembly and five resolutions of the National Assembly’s Standing Committee. At the same time, it also sent to the Government and the Prime Minister for issuance 111 decrees and 28 decisions, and promulgated 551 circulars within its competence. As of October 2018, the financial sector had 987 administrative procedures, including 298 tax procedures, 183 customs procedures, 184 securities procedures, 22 treasury procedures, and 300 other administrative procedures. Currently, the Ministry of Finance is sending to the Government a draft decree amending some decrees on investment and business conditions within its jurisdiction. It expects to reduce 117 business conditions herein. How have you achieved such strong reforms? It has been attributed to the consistent leadership and direction across all financial fields, producing good outcomes not only seen in specific fields, but standing complementary to each other among all fields. Reforming and streamlining administrative procedures and reducing business conditions help reduce the settlement time and compliance costs, facilitate people and enterprises, improve the business environment, enhance national competitiveness, tax index, and cross-border trade index. The ministry’s reform results have contributed to bettering the business environment and enhancing national competitiveness, which is highly appreciated by the society and community. At the same time, the outcomes are also reflected in index assessment. The Ministry of Finance is always among the Top 3 out of 19 ministries and ministerial-level agencies on the Public Administration Reform (PAR) Index in the last four years (from 2014 to 2017), and secures the top place in the ICT Readiness Index for six consecutive years (from 2013 to 2018). In the coming time, how will you continue to reform administrative procedures? In the coming time, the Ministry of Finance will further accelerate administrative reform and streamline administrative procedures to meet integration requirements and bring reform indices toward the ASEAN 4 level and toward OECD standards. Central solutions will be focused on enhancing the accountability of unit heads, improving law-making quality, citizen and business-centred administrative procedure reform, administrative and streamlined apparatus performance, and active information technology application to meet Industrial Revolution 4.0 requirements.